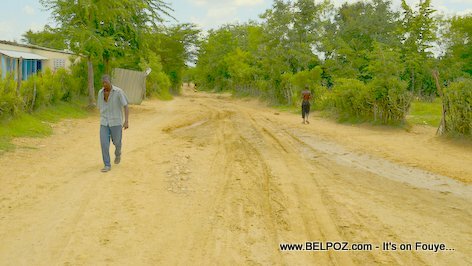 Haitian peasants in Trois Roches, a small village outside the city of Hinche, are forming a KONBIT Saturday in order to do some maintenance in the stretch of muddy road that leads to their village. KREYOL: Haiti - Yon group peyizan deside fè yon KONBIT pou retire LABOU sou wout ki rantre nan zone kote yo rete a... LETA pa vle fè l, yo oblije fè l poukont yo ak zong yo... Kisa ou panse de sa??? "Because of the rain, the road is very muddy," one resident said. "We will not wait for the government to come help us; They are not coming." So the community is getting together KONBIT style, men and women, with the little assistance they can find, and they will do whatever they can with their bare hands to fill the muddy holes on the road with rocks, sand, whatever they can find. Another businessman, a Hinche restaurant owner offered rice and beans to feed those who will spend the day out there. Another offers 8 bags of cold water sachets to quench the thirst of these volunteers who will spend the day in the hot sun only to keep the road in a "better-than-muddy" condition. It is a shame that people have to leave their daily activities to take care of something that really is the job of a government who is doing everything except but serving the people.